There are around seventeen species of hedgehogs in the world living in parts of Europe, Africa, Asia, and New Zealand. The African Pygmy Hedgehog originates from Africa and is the most common species kept as a pet throughout North America. Before bringing home and caring for a pet hedgehog, you will need to learn how to care for one properly to avoid poor health, and preventable disease. If you can provide the care they need, a hedgehog can be a great addition to your family. Like with other pets, purchasing your pet hedgehog from a breeder is recommended over a pet store. That’s not to say all pet stores are inherently bad but you usually have a better idea of the hedgehog’s health, age, and genetic history when you buy from a breeder. Before choosing a breeder, ask a variety of questions and scope past customers testimonials, this will help you determine their reputability. The average lifespan for a pet hedgehog is between 4 and 6 years but they can live as long as 10 years. The length of a hedgehog’s life depends on several factors: diet, genetics, disease, veterinary care, and subjection to predators. While you can’t do a lot about genetics, you can help keep your pet hedgehog safe by feeding them a balanced diet high in protein, familiarizing yourself with common ailments, accessing veterinary care, and keeping them safe from other pets and outdoor predators. 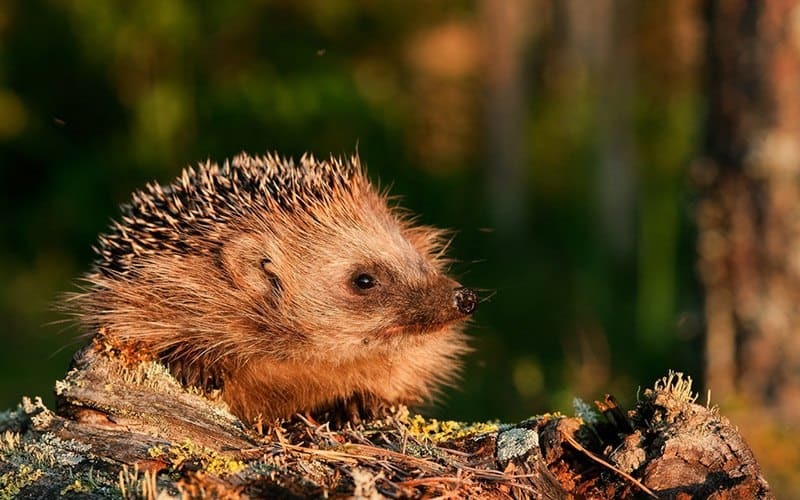 Hedgehogs living in their natural environment are known to hibernate during colder months, but this is potentially fatal for hedgehogs kept as pets. Warmer temperatures (between 72°F to 80°F) will discourage hibernation from occurring. Although pet hedgehogs are small, they need a lot of space to live an active, healthy life. The minimum recommended cage size is 4 x 2 feet. This will ensure your pet hedgehog has enough room to explore, eat, sleep, and hide while having enough room for their necessary accessories and toys. As far as your pet hedgehog is concerned, there is no such thing as too much space in their cage. If you have the room and it’ll fit in your budget, buy the biggest cage you can comfortably afford. As long as it has a solid bottom, most guinea pig and rabbit cages will work well for housing your pet hedgehog. You should avoid wire flooring because the wires can irritate your hedgehog’s sensitive feet after repeated exposure. Avoid placing your pet hedgehog’s cage near drafts, heaters, air conditioners, and windows because hedgehogs are sensitive to temperatures that are too hot or too cold. In their natural environment, hedgehogs are considered insectivores. This means they feed primarily on insects such as slugs, beetles, or termites but they will eat other small prey, like mice, bird eggs, and frogs when given the opportunity. Unlike their wild counterparts, pet hedgehogs are omnivores who need to be fed a well-balanced high protein diet. If you have ever browsed the small pet food section at your local pet store, you might have noticed there aren’t a lot of options geared towards hedgehogs. Luckily, moist and dry cat food is a great alternative as long it meets these requirements: between 20 – 28% protein and 5 – 15% fat and is made primarily from meat. Dry food will make up most of a hedgehog’s diet and is supplemented by moist food, and small portions of fruits and vegetables. Suitable fruits and vegetables to offer your pet hedgehog are apples, beans, and carrots. Hedgehogs need a constant source of water either from a stoppered water bottle or hanging water dish. You can learn more about what is included in a proper hedgehog diet here, and also things they should absolutely avoid eating. Make sure you pay close attention, and make a good little list of what hedgehogs eat that you can keep handy, to make sure your little pal doesn’t get sick from food. When this is a new pet for you, especially if you’ve had other pets with different diets, it can be easy to forget or to slip up – so we just want to remind you to take some extra care – just to make sure! Pet hedgehogs can be unique with their odd quirks. Here is a quick look at some of the most common behaviors you will notice in your beloved pet. As mentioned earlier, hibernation is a natural behavior in wild hedgehogs, but it is dangerous and potentially fatal for your pet hedgehog. Luckily, you have some say in the matter and can help your hedgehog avoid this behavior entirely. Your hedgehog will want to enter hibernation if the temperature drops too low so that’s why it’s important to keep the room temperature between 72°F to 80°F. Your hedgehog might initiate hibernation for other reasons, like inconsistent day/night cycle, illness, and age. Signs of hibernation include cold stomach, lack of appetite, lethargy, in-ability to un-ball, and wobbliness. This behavior is quite alarming for the new hedgehog owner. Your seemingly healthy pet hedgehog will start foaming at the mouth and contort their body, so they can lick the foam over their spines. You might think, “What is wrong with my hedgehog? !” but you’ll be happy to know that nothing is wrong with your little prickly pal. Self-Anointing is how a hedgehog familiarize themselves with a new scent. Although the purpose isn’t fully understood, many people believe it’s how they determine if something is toxic before eating it, a useful trait for an animal living in the wild! Rolling themselves into a little ball is a hedgehog’s response to a potential threat or fear. This behavior uses a muscle that runs along their body called the orbicularis muscle. When your hedgehog feels threatened, this muscle tightens, allowing them to contort their body into a ball-like shape. By balling-up, they can hide their head, belly, feet, and legs from perceived predators, exposing their prickly spines. Sometimes, hedgehogs will make noises while balled-up like huffing or snorting to appear more threatening. In the wild, hedgehogs will burrow to hide from predators. They might choose abandoned burrows, dense vegetation, or rocks as their burrowing space. Other times, they will dig their own hidden space under shelter. If you want to encourage this behavior in your pet hedgehog, you should provide boxes or commercial igloos that are large enough for them to turn around as hedgehogs will always enter and exit their burrows head first. This will enrich their environment while making them feel more secure in their cage. Scratching is a common behavior you will observe in your pet hedgehog. It is often a response to feeling nervous or curiosity when exploring. There are several times in your hedgehog’s life when they lose old spines and grow new ones, this process is uncomfortable, and your hedgehog might scratch while the new spines grow in. Dirty or dry skin is another reason why your hedgehog might scratch but this can be resolved with a good bath. Hedgehogs are usually efficient groomers, so you shouldn’t need to intervene often if you keep their cage clean. If dirt or bedding gets stuck in their spines, you can bathe them using warm water, toothbrush, and cat shampoo if you prefer. After filling a sink with about one inch of warm water, you can place your hedgehog into the water. Gently scoop water over their body, being careful to avoid their head, ears, and eyes. When using the toothbrush, carefully scrub their spines from front to back. If you used shampoo, you will need to rinse your hedgehog in fresh, warm water. Always fill the sink empty because the running water can startle your hedgehog. When you are finished bathing your hedgehog, you will need to dry them using a towel. You will want to make sure your hedgehog is completely dry before putting them into their cage, so this might mean using multiple towels. You need to trim your hedgehog’s nails regularly to stop them getting too long and sharp. Most people use a pair of human nail trimmers for this task. When you first start trimming their nails you will need to be patient because it can be a scary experience for your new hedgehog! Wait for them to relax, and make sure you don’t cut their nails too deep. When you cut to the quick, it can be painful for your hedgehog and often results in bleeding. Toys and accessories are beneficial for enrichment and fulfilling the instinct to burrow. Some popular accessories include plastic igloos and sleeping bags for sleep and security. You can also re-purpose fabric scraps and cardboard boxes for this purpose. Plastic is generally preferred because it’s easy to clean but fabric and cardboard is inexpensive and can be thrown out without breaking your budget. For toys, most hedgehogs enjoy toilet paper rolls, plastic balls like ping-pong balls or cat toys. You might find that your pet hedgehog enjoys the company of a stuffed animal that is a similar size to them. Some people will give their hedgehogs old slippers to play with and rawhide puppy chews. Unlike many small pets, hedgehogs do not need cage mates and will live a happier life on their own. Even in the wild, hedgehogs do not live in a colony and will only seek company during mating season. Male hedgehogs should never be housed together because they will fight, leading to injury or death. Some female hedgehogs can live with another female but there is more success with this if they are raised together. Hedgehogs are notoriously shy, and it might take some time (and a lot of patience!) until they are comfortable with you. You should pick up your hedgehog by reaching under their belly and avoid handling while they are balled-up. Although their spines don’t usually break the skin, they are prickly and will cause discomfort if you try and hold them in this state. Eventually, your hedgehog will start to enjoy your company. Like most animals, hedgehogs aren’t immune to ailments and diseases. Here is a quick rundown on the most common conditions that could affect your pet hedgehog. Like your cat and dog, hedgehogs can become infected with fleas and ticks. While it isn’t common, you should be aware of the signs: redness, rashes, and excessive scratching. Topical flea medication for cats like Advantage can be used but only under the supervision of a veterinarian. Mites can cause skin infections and the common symptoms are loss of spines, dry or flaky skin, and excessive scratching. Wax buildup is a common culprit for ear infections in your hedgehog but sometimes the culprit can be mites or fungus. A common cause of respiratory infections in hedgehogs is cold environments. Symptoms are similar to human colds – lethargy, loss of appetite, and heavy breathing. The best way to prevent tooth and gum disease in pet hedgehogs is providing plenty of dry food. Symptoms include loss of appetite, red/swollen gums, drooling, and foul-smelling breath. Cancer is a fairly common disease affecting hedgehogs and it can occur in any part of the body. The first sign of cancer is typically the development of a tumor. Wobbly Hedgehog Syndrome (WHS) is a serious degenerative neurological disease that affects hedgehogs around the world; usually between the ages of 2 and 3. This incurable condition leads to paralysis and death within the first 18-24 months after the first signs are observed. The first signs of WHS is loss of full muscle control and weakened muscles. It is usually described as a strange ‘wobble’ when the hedgehog is trying to stand still. While you can make your hedgehog’s life more comfortable during this time, you will eventually need to visit the uncomfortable decision of euthanasia when their quality of life is severely affected. While you can provide comfort at home, most ailments and diseases will require the assistance of a veterinarian who specializes in the treatment of exotic pets. As exotic veterinarians can be difficult to find, it is a good idea to find clinics before you need care. It is recommended that you bring your new hedgehog for a checkup around two to four weeks after bringing them home. It might seem strange to wait, but it’s important for your hedgehog to have a relationship with you to help ease them through a stressful visit with the veterinarian. Annual check-ups are recommended for hedgehogs because a veterinarian might spot signs of illness that we have overlooked. At this time, there are no vaccinations for hedgehogs, but they can be treated for parasites and mites. Now that you understand the specific needs of a hedgehog and how to take care of one properly, you can make an informed decision regarding bringing one into your own home. They can be a fun addition to most homes, but their specialized care and timid personalities might be a lot to take on for your household. What Do Hedgehogs Eat & What Should They AVOID In Their Diet?